We have been excited to see our outfitters embrace video and photo sharing and using new email notifications to maintain closer contact with guests. We want to continue to encourage use of these features, but they place a substantial burden on the system with close to a million photos and hundreds of hours of video being stored today. As a result, we will need to introduce usage-based pricing to help cover the increased load generated by particularly large collections of photos and emails. Starting on January 1, 2017, Arctic Reservations will be introducing usage-based pricing. The majority of outfitters will see no change in their monthly charges. All affected outfitters have already received email notifications and can see estimated charges on their invoices. For those that do see an additional usage charge, we aim to keep the pricing manageable and will be adding some new tools to help you reduce usage as needed or desired. When the new usage tools go live, you will be able to access them by going to the “Settings” page under “General Settings” and clicking the “Pencil” icon next to “Usage”. On the “Usage” page, Arctic will display all of your current usage statistics. 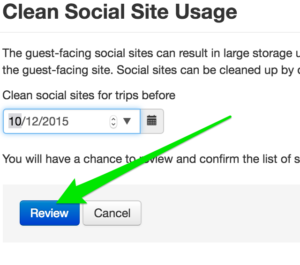 At the bottom of the page, you will find two buttons, a “Clean Social Sites” button and a “Clean Photos For Sale” button. 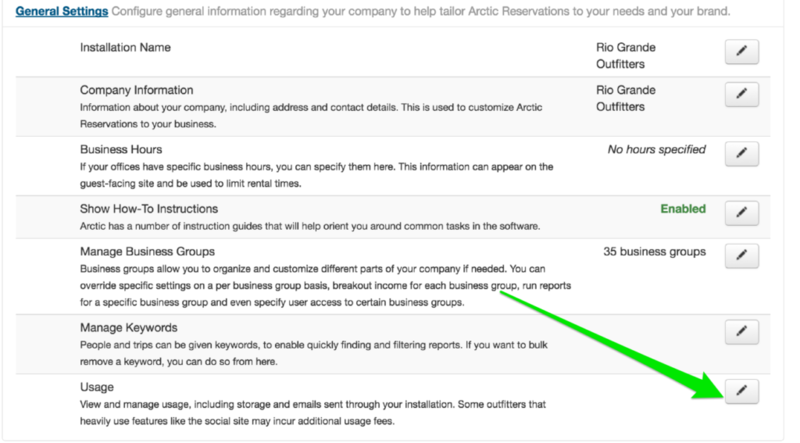 When you click either of these buttons, you will be able to specify a date and Arctic will remove all social sites or photos for sale for trips prior to the date that you entered. By default, Arctic will choose a date one year prior to the current date. You can alter the date to be any date you prefer. Once you have selected your date, you will be able to then review your date selection before permanently deleting the social sites or photos for sale. Note: Once the photos or social sites have been cleaned, they cannot be recovered. All content will be permanently deleted. As mentioned, these tools are still in development but should be live by the end of the month to give any effected outfitters plenty of time to manage your usage before the usage-based pricing takes effect in January. We will announce when the new usage management feature goes live, so keep an eye on our Twitter feed on your dashboards. With the usage tools provided, you will be able to easily maintain your usage within an acceptable range of expense for your installation. If you have any questions about the usage-based pricing or how to use the usage management tools when they go live, please feel free to contact support and we will be happy to help.